I have to mention one more cookie before the holiday season ends. This was a new one for me. It’s from the book Southern Italian Desserts by Rosetta Costantino. I received this book as a Christmas gift a year ago, and there are delightful cakes, pastries, tarts, gelatos, fruit desserts, and lots of cookies in it. Since I first read the book, I’ve been thinking about the La Deliziosa sandwich cookies filled with hazelnut cream. The cookies are actually made from pastry that’s cut into circles and then sandwiched with a pastry cream with added hazelnut paste. Last, the edges are rolled in finely chopped hazelnuts. They’re delicate and pretty, and they look delicious in the photo in the book. However, I needed to bake some cookies that would ship well and that could be kept at room temperature for several days. That’s how I arrived at the page for these crunchy, little cinnamon cookies. 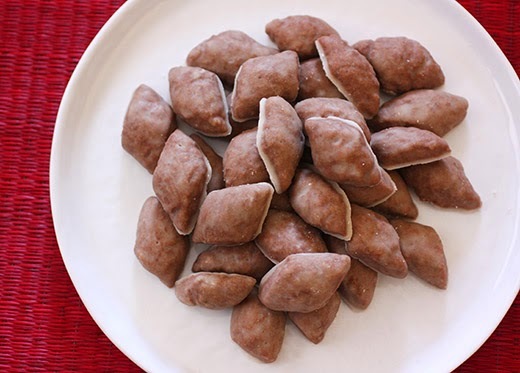 The recipe is from Puglia, and it includes lots of great flavor from cinnamon, cocoa powder, and lemon. 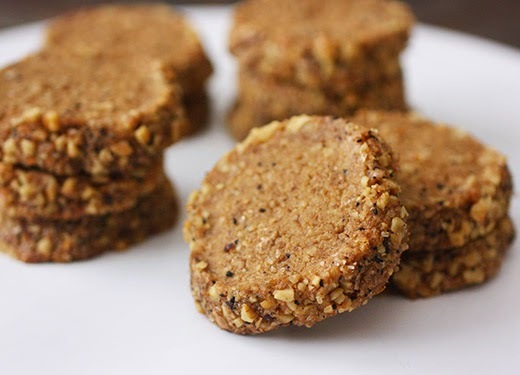 It also makes a lot of cookies, but they’re petite, bite-size cookies that could last for weeks in theory. I’m not actually sure how long they could last because between packing and sending some and nibbling the rest, they disappeared in just a few days. The dough couldn’t be easier since it’s simply mixed with a fork and then kneaded by hand. Flour, sugar, cocoa powder, cinnamon, and baking powder were combined in a large bowl. A well was made in the center of the dry ingredients, and eggs, vegetable oil, a little milk, and lemon zest were added and mixed with a fork before being kneaded by hand. The dough was then wrapped in plastic wrap and set aside for about 30 minutes. To form the cookies, the dough was first divided into four pieces. Each piece was rolled by hand into a long rope just a little over one half inch wide. The rope was cut on the diagonal into one-inch pieces that were placed on baking sheets and baked for twelve minutes until puffed and firm. A glaze was made with confectioners’ sugar and lemon juice. The cooled cookies were tossed in the glaze and then set on baking sheets to dry. It takes several hours for the glaze to dry completely, and I left the cookies to dry overnight. Once dry, they were ready to be packed and shipped. 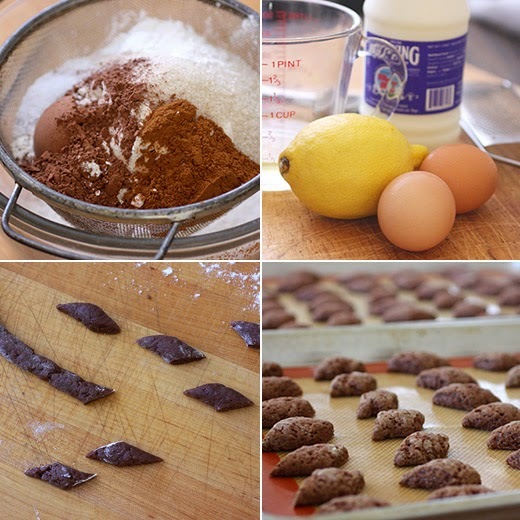 I was intrigued by the combination of cinnamon, cocoa, and lemon, and now I’m so glad to have tried these cookies. Cinnamon takes center stage among the flavors, but the cocoa and lemon don’t go unnoticed. All together, they made these cookies completely addictive. And, since they’re tiny cookies, it’s very easy to keep reaching back for more. Next, I’ll have to circle back to the delicate hazelnut cookies or maybe some classic cannoli for serving right at home. I knew all about the pastries and breads made at Tartine Bakery and have read and baked from the books by Elisabeth Pruett and Chad Robertson. But, I didn’t know what kinds of culinary creations were happening at the restaurant Bar Tartine with co-chefs Nicolaus Balla and Cortney Burns. I received a review copy of the new book, Bar Tartine , and learned about their approach to crafting every part of a dish in-house. They source the ingredients to dry and grind their own powders like yogurt powder, kale powder, smoked onion powder, and citrus peel powder. They make their own cheeses like goat cheese and a cheese similar to feta as well as buttermilk and kefir. They sprout seeds and beans and soak nuts to make their nutrients more easily absorbed and grow their own microgreens. Instructions for making all of these things are in the book along with recipes for infused oils and vinegars, pickles, syrups, and stocks. All of these edible building blocks are layered into their dishes resulting in complex, fresh flavor combinations. The inspiration comes from various traditions like Hungarian, Japanese, and Scandinavian food. I keep looking back at the salads like the Wedge Salad with Buttermilk, Barley, and Sprouts; the Kale Salad with Rye Bread, Seeds, and Yogurt; and the Cauliflower Salad with Yogurt and Chickpeas. The Shared Plates chapter includes things like Buckwheat Dumplings with Paprikas Sauce, Brussels Sprouts with Dried Tuna and Tonnato Sauce, and Sunchoke Custard with Sunflower Greens. 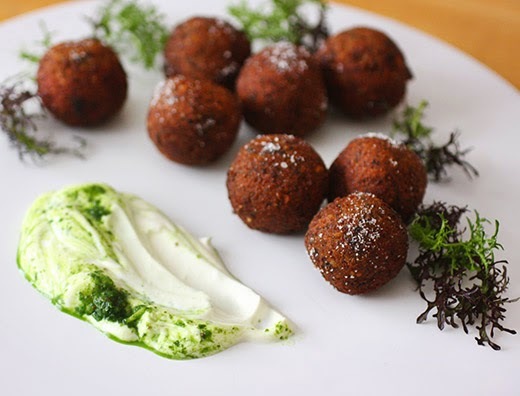 When I saw the Lentil Croquettes, I had to try them even though I wasn’t sure I’d be able to create every ingredient myself as they do at the restaurant. Of course, you can pick and choose what elements you’d like to make and what you’d prefer to purchase. I did sprout the lentils and make kombu dashi, but I bought pre-made yogurt and onion powder. 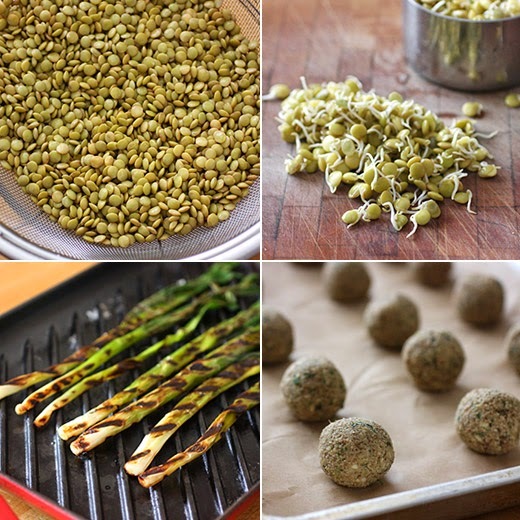 It takes a few days to sprout lentils, so you need plan ahead. First, the lentils were soaked overnight, and then drained in a strainer, rinsed, and left sitting in the strainer over a bowl covered loosely with a towel. They were rinsed three times per day until the little sprouted tails appeared. You can refrigerate them whenever they develop the length of sprouted tails you prefer, and they can remain the refrigerator before being used for about a week. I made extra and stored the rest in the freezer. Next, I moved on to the kombu dashi which was a simple process of soaking kombu in water to soften before simmering it for about an hour. It can be cooled and stored in the refrigerator for a couple of days. For all of the ingredients, there are options, and I chose the simpler route for the remaining items. Rather than making kefir cream, I used yogurt. A watercress sauce was to be lightly stirred into the yogurt, but watercress isn’t common here. I used some locally-grown arugula instead. The blender pitcher was chilled in the freezer, and then arugula, some of the kombu dashi, toasted and crushed coriander and caraway seeds, and salt were pureed. This was set aside and mixed into the yogurt just before serving. To start the croquettes, green onions were charred on the stovetop. I used a grill pan and pressed them with a cast iron skillet on top. They were grilled until charred in places and left to cool. In the food processor, the lentil sprouts, the charred green onions, crumbled rye bread, some ricotta since I didn’t make farmer’s cheese, garlic, a chopped serrano, store-bought onion powder, toasted caraway seeds, paprika (also store-bought and not homemade), salt, and more dashi were pulsed until the mixture formed a paste. Little balls were formed from the lentil paste and fried until crisp. I served the croquettes with the arugula sauce just barely stirred into the yogurt and a few sprigs of baby mustard greens. It seems like this dish could fit squarely into the hippy food category, but I promise it tastes like so much more than cardboard. 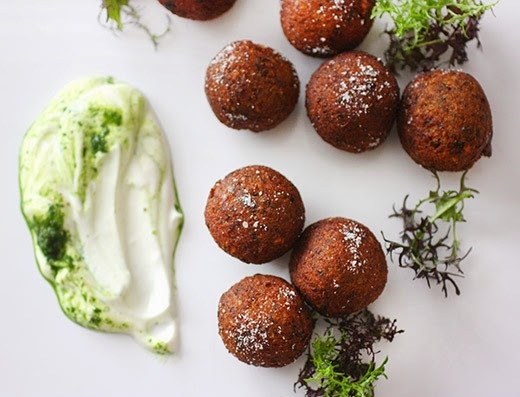 The croquettes are full of savory flavor with fresh chile, garlic, and the charred onions. And, running them through the yogurt sauce on the way to taking a bite added fresh, tangy pepperiness. This is a book that will get you thinking about new and different flavor combinations and ways to add pops of seasoning to all sorts of dishes. Recipe reprinted with publisher’s permission from Bar Tartine . This is a dish of addictive contrasts: crisp, warm, and spicy against cool, acidic, and refreshing. Inspired by dahi vada, a fried lentil dumpling served with spiced yogurt – and one of our favorite Indian snacks – flavorwise these croquettes skew more toward Budapest than Bombay. Of course, the spice trade that passed through India brought many of the spices that characterize Hungarian food, such as caraway and paprika. We like to think that this dish reflects that journey – an Indian dumpling from the banks of the Danube. TO MAKE THE KEFIR SAUCE: In a small bowl, combine the kefir cream, honey, and salt and mix well. The sauce can be made up to 1 day in advance and stored in an airtight container in the refrigerator. TO MAKE THE WATERCRESS SAUCE: Chill a blender beaker in the freezer for at least 15 minutes. In the cold blender, combine the watercress, dashi, coriander seeds, caraway seeds, and salt and puree until smooth. Transfer to a bowl and let stand at room temperature while you prepare the croquettes. This sauce tastes best if eaten the day it is made. TO MAKE THE LENTIL CROQUETTES: Heat a large cast-iron skillet over medium- high heat until a drop of water flicked on the surface sizzles gently on contact. Add the green onions to the hot skillet and press down on them with a weight or heavy pan. Cook until the onions begin to char, about 3 minutes. Turn the onions over, press down on them with the weight, and cook until charred on the second side, about 3 minutes. Continue until all sides are evenly charred but not completely black. Let cool to room temperature. In a food processor, combine the lentil sprouts, bread, charred green onions, farmer’s cheese, garlic, chile, onion powder, caraway seeds, paprika, salt, and dashi and process until a smooth paste forms. Using your hands, gently shape the mixture into 2-in/5-cm balls and put them on a large plate or sheet pan. The croquettes can be shaped a day in advance, covered with plastic wrap, and refrigerated overnight; bring to room temperature before frying. Pour the rice bran oil to a depth of 2 in/5 cm in a cast-iron or other heavy-bottomed saucepan and heat to 350°F/180°C. Line a sheet pan with paper towels and set a wire rack on the pan. Add the croquettes to the hot oil a few at a time and fry until browned and crisp, about 2 minutes. Using a slotted spoon or a skimmer, transfer them to the prepared rack to drain. Repeat with the remaining croquettes. To serve, add the watercress sauce to the kefir sauce and stir gently to mix the sauces slightly without incorporating them fully. The mixture should be a swirl of green and white. Transfer the croquettes to a serving platter and spoon the kefir-watercress sauce on top to cover the croquettes. Top with sour cherry syrup and garnish with the lentil sprouts, watercress, and cilantro. I started off cookie baking season with a few completely new and different varieties. I wanted to bring some treats to a meeting, and I knew several of the people attending avoid eating gluten. Luckily, I had a review copy of Alice Medrich’s latest book, Flavor Flours , to use for inspiration. Medrich set out to experiment with flours like rice, oat, corn, sorghum, teff, buchwheat, coconut, and nut flours to discover new flavor combinations, and all of the recipes in the book are gluten-free. Unlike other gluten-free recipes that involve mixes of several flours and starches, these recipes mostly stay true to one type of flour at a time. There’s a chapter for each flour, and the recipes highlight the flavor, texture, and aroma of that flour. The New Classic Boston Cream Pie is made with layers of corn flour chiffon and a pastry cream that incorporates rice flour rather than wheat flour. I’ll definitely try this soon since Boston Cream Pie is Kurt’s most favorite dessert ever and also because the light corn flour chiffon and super silky pastry cream promise to be better than the original versions. The Carrot Spice Cake with Cream Cheese Frosting with rice and oat flours is another updated classic I want to try. The Savory Corn Sticks that are sprinkled with smoky paprika would be great with a cocktail, and the Panforte Nero with buckwheat flour, cocoa powder, and spices sounds like an ideal addition to a cheese course. The Chestnut Jam Tart was the first recipe I tried since it was described as a “simpler-to-make linzer torte.” It’s a sturdy tart that can be cut into small servings that are easy to pick up and eat with your hands. The crust comes together in record time once you have chestnut flour of course. I was determined to locate it, and thankfully one of our newest Whole Foods Austin locations was able to special order it for me. The dough was pressed into a tart pan and was topped with strawberry jam and then sliced almonds and bits of reserved crust dough. The added flavor from the chestnut flour was lovely with the jam and nuts. I also made the Brown Sugar Pecan Nutty Thumbprints. The dough is a puree of pecans, sugar, brown sugar, salt, and an egg. It’s a very sticky dough, but once chilled it was easy to shape into balls to be baked. The balls flatten a bit as they bake. When removed from the oven, indentations were pressed into the cookies, and they were filled with jam. Pecans and brown sugar is a pretty perfect pairing. Last but certainly not least, I tried the sorghum flour shortbread cookies shown here. 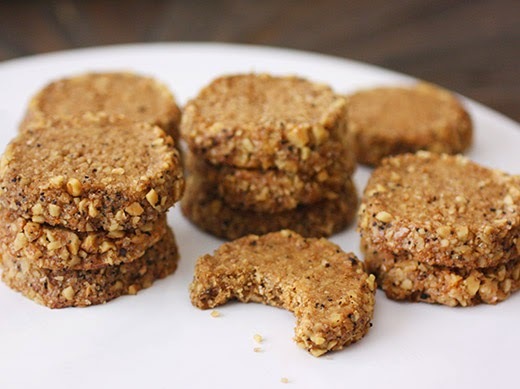 The Coffee and Walnut cookie is a variation on the Salted Peanut Shorties in the book. 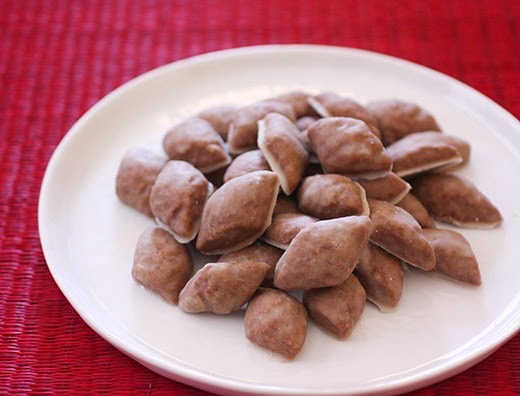 The dough was made by pulsing walnuts, finely ground coffee beans, and salt with sorghum flour, rice flour, and sugar in a food processor. Chunks of butter and cream cheese along with a splash of bourbon, vanilla, and one of water were added, and the mixture was processed until it formed a smooth dough. The dough was shaped into a log on parchment paper, and I added a step to the process here. 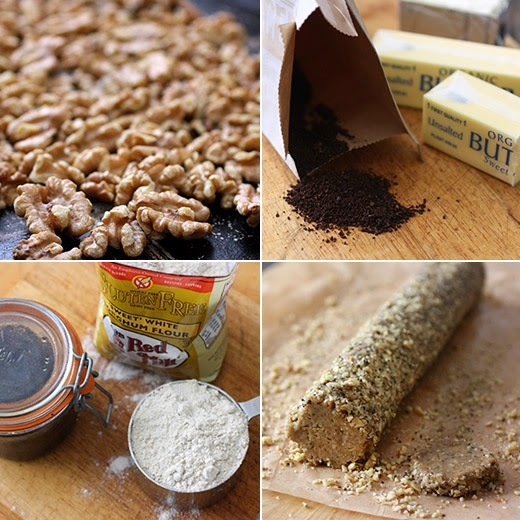 I chopped some additional walnuts, added a little more finely ground coffee and some demerara sugar, and rolled the dough log in the nutty mixture. The dough was then wrapped and chilled overnight. The next day, one quarter-inch rounds were cut and baked until golden on the edges. It’s no secret that I love the flavor of coffee in sweets and that I love baking with various types of flour. This cookie was sure to be a hit with me. The shortbread is tender and crumbly in the best way, and the coffee balances the sweetness. It’s going to be fun to bring new additions to my bins of various flours and bake more treats with all their unique flavors. I always have a hard time choosing what to make for Thanksgiving dessert. It was especially difficult this year since I’d just read a couple of new baking books and had even more delicious ideas than usual. There were two different sweet potato pies that were very strong contenders, and I’m already planning to choose one of them for the top of next year’s list of dessert considerations. After some serious reflection and dessert-focused meditation, I decided to go in a fruity direction with the Cranberry Pie from Nick Malgieri's Pastry . This was one of the recipes in the book that got my attention when I first flipped through the pages. The cranberries make a pretty filling, and the added pecans give it great texture. There’s an option for adding a nut crumb topping, and I couldn’t resist. Regarding crumb toppings, I’m one of those people who tend to double the quantities to make a very generous topping. I can report that technique is not necessary here. The amount of crumb topping suggested covered the pie completely and was almost too much. 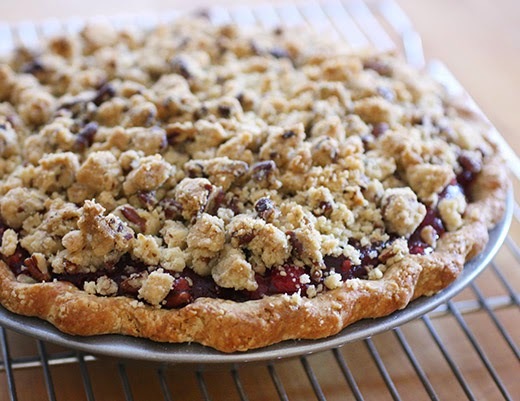 (almost) And, interestingly, Malgieri suggests baking the crumb topping separately on a baking sheet for a bit before adding it to the pie. It gets delightfully crispy and crunchy, and I’ll remember to do that with other crumb topping from now on. The pie was baked in a nine-inch pie pan, and a sweet crust dough was made in advance and fit into the pan. I left the prepared but unbaked pie crust in the freezer until the filling was ready. For the filling, one and a half pounds of cranberries were combined with a third of a cup of sugar, two thirds of a cup of brown sugar, a tablespoon of freshly grated ginger, the zest of an orange, a half of a cup of orange juice, four tablespoons of butter, a half teaspoon of cinnamon, and a quarter teaspoon of ground ginger. This mixture was brought to a simmer in a large saucepan and stirred often. There’s a warning in the recipe that if the filling is overcooked, it will be hard once baked in the pie. The mixture only cooked for five minutes, maybe even less than five minutes, just until thickened. It was left to cool, and then a half a cup of chopped pecans was added. For the crumb topping, one cup of flour was added to three tablespoons of sugar, a quarter teaspoon of freshly grated nutmeg, one half cup of chopped pecans, and six tablespoons of melted butter. The mixture was stirred together evenly and left to sit for five minutes for the flour to completely absorb the butter. It was broken into crumbles and scattered on a parchment-lined baking sheet. It was baked at 350 degrees F for about 15 minutes. 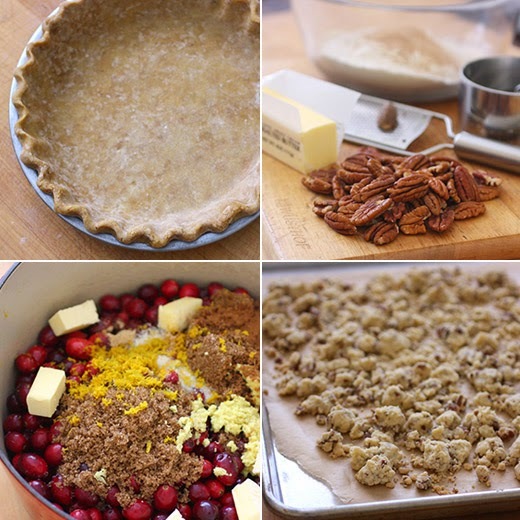 Next, the prepared pie crust was filled with the cranberry mixture, the pre-baked crumb topping was strewn about on top of the pie filling, and the pie baked at 350 for about 40 minutes. 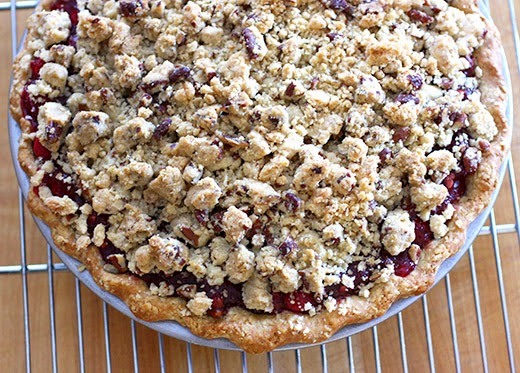 Even with the nutty crumb topping, this pie isn’t overly sweet. The tart cranberries give it great, fruity flavor and temper the sweetness. I served the pie with maple-sweetened whipped cream to fit the Thanksgiving theme. I don’t think any of the desserts I considered would have been bad choices, but I’m thrilled to have gotten to taste this cranberry pie. And, now that the Christmas season is upon us, I need to start making another holiday dessert decision.